The next era of the Washington Redskins begins today. And fans hope it won't be as rocky as the last one. Mike Shanahan and the Redskins reached a deal Tuesday for the former Broncos coach to take the reins of the team. Sources familiar with the negotiations told the Denver Post that the deal is for five years and about $7 million per season -- about the same salary he had during his final contract with the Broncos. Shanahan was introduced as the team's head coach at a Wednesday afternoon press conference. "We were looking for a man who was passionate about football, passionate about the Redskins, someone who had a good winning record and someone who could lead our team, on and off the field, lead our coaches, on and off the field, to the greatest heights," GM Bruce Allen said. "Ladies and gentlemen, we got our man." 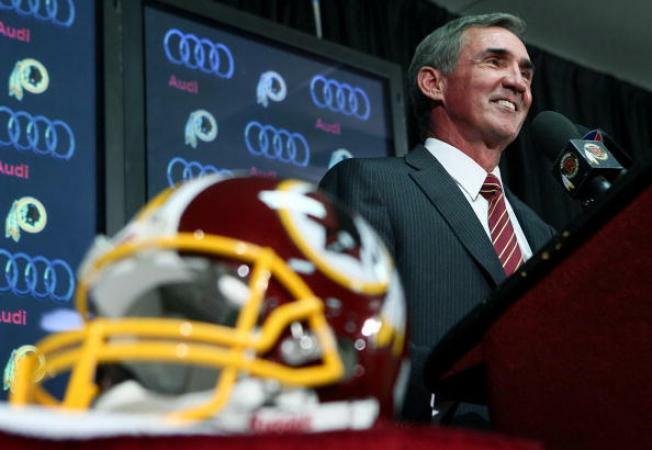 "We needed a guy like Mike Shanahan," cornerback DeAngelo Hall said. "We needed a proven leader, a proven winner. He's definitely going to get these guys motivated and get the most out of all of them." On Wednesday, Shanahan insisted that ultimate authority won't come into play, as he and Allen will work together as a team. Schefter said that as the contract was signed, Shanahan and owner Dan Snyder posed for a picture, then everyone involved went out for dinner to celebrate. NBC4's Lindsay Czarniak staked out the dinner at The Palm Restaurant. Shanahan told Czarniak he was "very excited" and that it was "great to be in the nation's capital." He then said he'd have more to say on Wednesday, when the Redskins hold a press conference. Snyder declined to comment while getting into an SUV with Shanahan, but offered a thumb's up. Schefter reported that Shanahan's son, Kyle, will become the Redskins' offensive coordinator. He's currently the offensive coordinator for the Houston Texans. The arrangement between coach and feneral Manager Bruce Allen will be similar to the working relationship Shanahan had with Broncos General Manager Ted Sundquist from 2002 through 2007, the Denver Post reported. Sundquist oversaw the draft, contracts and roster construction, but Shanahan had final say authority on every decision. Shanahan's final authority on football decisions would be the same arrangement Snyder had with coach Marty Schottenheimer in 2001 -- before the two butted heads and Schottenheimer was fired after an 8-8 season. Snyder also deferred to Joe Gibbs when the Hall of Fame coach came out of retirement, and Gibbs made the playoffs twice in four seasons. Overall, however, the Redskins are 82-99 since Snyder bought the team, missing the playoffs in eight of 11 seasons. Shanahan will be Washington's seventh coach since Snyder came along in 1999 -- a stretch that has included only two playoff victories for a team that proudly boasts three Super Bowl victories. The toll of mediocre records and accompanying fan unrest left Snyder little choice but to hire established names and put them in charge. The messy 2009 season managed to spill over into yet another day Tuesday, when quarterback Jason Campbell and running back Clinton Portis traded barbs about leadership in separate interviews on the radio and Internet. Shanahan was optimistic in discussing Campbell. "I'm looking forward to working with him," he said. "I just love the way Jason handles himself. I'm looking forward to sitting down and watching film, going through every play that he's had throughout his career, and sitting down and talking to him. Hopefully the best years are ahead." He sounded less confident in Portis. "I gotta go back and look at all the film," Shanahan said. "Just to watch a game and not be around Clinton in the offseason program, not watch him on a day-to-day basis would not be fair to him, would not be fair to you, me judging him. I think like all players as they get older, I think the key is how they work in the offseason program, what they do to make themselves better. I've been around some veterans who've been very successful and all of a sudden they quit working out, and as a running back, he can fall off a cliff." Portis has a reputation for appreciating practice about as much Allen Iverson does, but Shanahan commended the running back for his toughness and noted his productivity when Shanahan coached him in Denver for two seasons. Shanahan arrived in the D.C. area Monday afternoon and went straight to Redskins owner Dan Snyder's home. Shanahan's agent joined them Tuesday. Shanahan has a 146-98 record in 16 seasons as a head coach in the NFL -- the first two with the Los Angeles Raiders. He was 8-5 in the playoffs, including Super Bowl wins in 1997 and 1998. He made the playoffs in half of his seasons in Denver, and had only two losing seasons -- 6-10 in 1999 and 7-9 in 2007. He was fired a year ago after they missed the playoffs for the third straight season. The Redskins job became available when Jim Zorn was fired early Monday after a 12-20 record over two seasons.